So, the consoler-in-chief has visited Las Vegas in the wake of a mass slaughter at a concert there, and, unlike yesterday’s shameful performance in Puerto Rico, he stayed on script. He called the gunman “sick and demented, ” but he refused to be drawn into discussing solutions to the mass killings. Don’t look to Donald Trump to exert leadership on gun safety. Neither is the Republican Congress a reason for optimism. When other countries have suffered mass shootings, they’ve taken action, successfully. Twenty-one years ago, a mass shooting in Australia left 27 dead and 35 wounded. Australia restricted sales of automatic and semi-automatic weapons, instituted a national registry and a 28-day waiting period. There has been a concomitant drop in gun violence. The deadliest shooting in UK history left 16 children and one teacher dead and led to bans on the private ownership of automatic weapons and certain handguns, which reduced gun violence. Not here in the U.S.of A. Horrible carnage has been met with Congressional indifference, this though well over 80 percent of Americans favor more serious background checks, a modest step indeed. Clearly that would require cleaning up mental health and criminal justice data bases, and that would cost a few bucks. But, it seems, we’d rather pay in lives than dollars. The National Rifle Association has for 20 years stopped Congress from even allocating money for research by the Centers for Disease Control into the public health impact of guns. Perversely, we’re going in the other direction. Congress blocked banning gun sales to people on the no-fly list and upheld the rights of the mentally ill to buy assault weapons. There’s strong support in Congress right now for requiring interstate reciprocity of licenses to carry concealed handguns. In the wake of Las Vegas, it appears that an expected vote on loosening regulations on the sale of silencers may be temporarily delayed. There could be consideration of limiting the sale of so-called “bump stocks,” a legal modification to turn semi-automatic into fully automatic guns to increase their kill power. 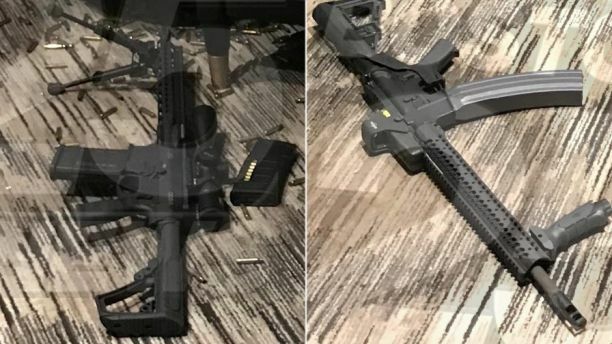 (Twelve of Las Vegas killer Stephen Paddock’s 47 guns were retrofitted with such devices.) Given Congress’ track record, it’s hard to be optimistic. The White House says it’s “too soon” to talk about this in the wake of the slaughter in Las Vegas that left 59 dead (so far) and more than 500 injured. If not now, then when? Mass. Congressman Seth Moulton had it right. He (along with Cong. Katherine Clark and others) refused to participate in yesterday’s moment of silence in reaction to the mass shooting, rightly saying that the only correct course is action. But even some of their Democratic colleagues don’t want to make this an issue, fearing it will hurt their efforts to take back the House in the 2018 election. A slight reason for optimism is that the percentage of families owning guns in the United States has dropped significantly in the last two decades. But the number of guns owned on average by those families has doubled in the same time period. And support for unqualified Second Amendment rights has also gone up. Every time there’s a mass shooting sales of guns and gun accessories have gone up. There have been more than 1500 mass shootings since Sandy Hook, when NRA CEO Wayne LaPierre said the only way to stop bad guys with guns was for more good guys to have guns. That, too, is crazy. Even if the 22,000 concert patrons in Las Vegas had been armed, they would have been powerless to stop Stephen Paddocks firing down from the 32nd floor of the Mandalay Bay Hotel in Las Vegas and killing them. Paddocks’ motives are still unknown. It does not matter if he was mentally deranged or ideologically driven. We can no longer as a society continue to put weapons of mass destruction in the hands of anyone who would act on his evil intent. It is unacceptable to conclude, as disgraced Fox host Bill O’Reilly asserted, that mass shootings like that in Las Vegas are simply a price we must pay for freedom. This entry was posted in Culture, Politics, Uncategorized and tagged concealed carry reciprocity, Cong. Katherine Clark, Cong. Seth Moulton, easing availability of silencers, gun control in U.K., Killer Stephen Paddock, Las Vegas slaughter, limiting "bump stocks", Mass shootings in Australia, National Rifle Association, Support for background checks. Bookmark the permalink. We are a nation wracked by political dysfunctionality. My condolences to the youth and future generations who will left to deal with the consequences of a country hopelessly in debt and generations of policy-making by lobbyists roaming the halls of Congress. And now we have Trump as president. Rock-bottom here we come. Oy. Well said. Unfortunately. It’s been said almost as well so many times before that I’m not surprised by O’Reilly’s quote. If the rest of us accept what he said, heaven help those of us who define freedom as a protection against the killers. To our Founding Fathers it meant freedom from oppression not freedom to oppress.